To protect the security of your TeamForge account, change the password regularly. Select My Settings from the My Page menu. In the User Details section, click Change Password. In the My Workspace / Change Password page, enter your current password. Click Update. You will see a message that your password was changed successfully. 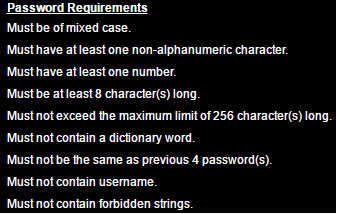 How can I enforce strong passwords?